This short excerpt comes from a book titled, “Askesis: Notes on Epictetus’ Educational System,” (Hijmans, B. L.). It touches on a variety of topics, and this particular bit touches Stoic theology. I’ve worked through it once “quickly,” it relies heavily on primary sources, often not in translation, with the occasional German, French, and Latin thrown in for good measure. I’m going to need to sit down and spend some serious time with this before my thoughts are finalized, but initial impressions are high favorable. The book is exceedingly well-researched. Whenever we discuss the God of the Stoics, Zeus, Providence, or any other word for this concept in Stoicism, there is often an immediate knee-jerk like reaction from many that prompts them to argue against the Abrahamic God. 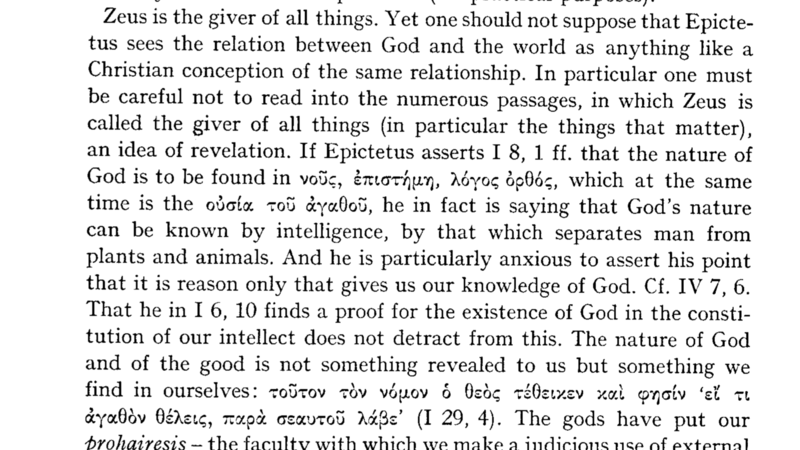 This short paragraph should lay that particular point to rest, and begin to show how the piety of Epictetus is based in gratitude for reason. Specifically λόγος ὀρθός, or “right reason,” and the prohairesis. I’ve been wrangling with the conception of Stoic theology and piety for some time, and I think can begin with gratitude and an appreciation for natural beauty. I’ll keep you updated on how that goes.